The last time we saw a human-imitating android, we were nearly convinced it was a real person that is until it started blinking and repeatedly nodding like it was a headbanger. The problem is that, no matter how realistic a robot looks, whenever it moves, we end up stuck in the uncanny valley. A group of Italian researchers from the University of Pisa believe that they can solve this problem with a truly expressive robot. To this end, the scientists created a facially expressive robot called FACE (Facial Automation for Conveying Emotions) that can mimic facial expressions for anger, disgust, fear, happiness, sadness, and surprise. FACE’s expressions are powered by a system of 32 motors, known as the Hybrid Engine for Facial Expressions Synthesis (HEFES). The motors manipulate the robot’s artificial skin in the same way human facial muscles do, allowing it to transition from one expression to the next. In addition to expressing six-basic emotions, HEFES can actually make facial expressions that lie between one or more basic emotions. 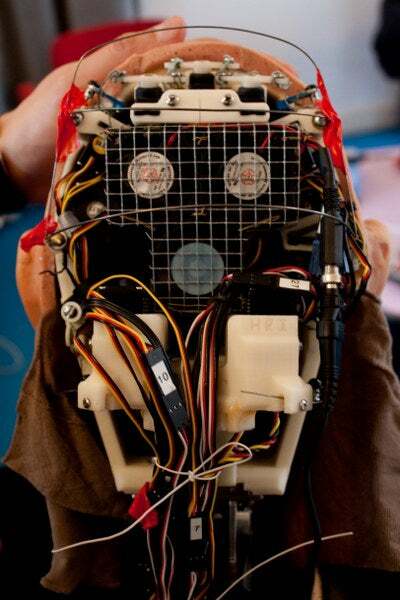 To create the expressions the robot utilizes a Facial Action Coding System, which categorizes facial expressions in terms of anatomical muscle movements. While FACE looks like an impressive step towards more expressive robots, it’s still clearly a robot. The robot changed facial expressions too smoothly and too slowly to match the organic movement of a person’s face. Another problem is that I’ve never seen a human hold a single expression as still and perfectly as FACE does. Are you convinced? Leave a comment.